Game review: [RRR Professional] A Cold Adventure. [RRR Professional] A Cold Adventure. This review is an entry for the RRR (Royal Review Rumble), a contest hosted on forums.sploder.com. Join the Community Forums for more contests, inside information on upcoming developments, connections with famous members, and more! A while ago I reviewed a game called M I N D, which was less of a review and more of a discussion on the art of game making and how mechanics and aspects unique to Sploder either help or hinder the designing process. I questioned whether a stellar visual style could make up for average gameplay or lackluster ideas. I also deliberated on how much a potential feeling of letdown or disappointment could be attributed to the game maker, and how much could be blamed on the limitations of Sploder itself. With Summit by autumnwinter, the answers seem easier to ascertain, if not simpler and less substantial. According to an existing review by tbremise, Summit was a game submitted to this year�s EGD (Epic Game Drop, see top paragraph for more details), and not only did it win first place for a Physics Game and first place for the Amateur category, but it also won third place overall � competing against veteran game makers who have amassed a boatload of features and EGL entries for themselves over the years. No question about it, I was impressed, and eager to dive in and experience what this game had to offer. I died one second within the first level, which I wasn�t even supposed to die in. Let me explain. This gimmick started popping up in Physics games about two or three years ago where Level One would be a title screen, showcasing the game�s graphics and visual style, and there would be a large START button the player would click on to � you guessed it � move onto the next level and start the game. Some particularly pernicious creators would also add a QUIT button, and clicking it would end the game and you�d have to start over. In this title screen, there is a START and a �VOTE� button. I clicked on VOTE and it killed me. Like, I actually died. The game hasn�t even started yet and it�s basically telling me the price for voting is death. I gave the game one star because it killed me. Then I actually started playing. The story revolves around Nikolay, a college freshman at a Russian school, whose older brother Gustav comes down with a rare, fatal disease. For some reason, a freshman in college is the only person in the world who can gather the ingredients for and concoct the cure, so Nikolay traverses the (fictional) Mt. Domna to reach his brother, who�s an even bigger introvert than me, resulting in him building his cabin thousands of miles away from everything else on the mountaintop. Along the way, Nikolay must face freezing cold, elementary school puzzles, and�to be honest, that�s pretty much it. Right away you can tell this is a visually outstanding game. I gave M I N D high praise for the its hyperrealism, but this game is gorgeous in a more cartoony, colorful way. In the background, a mountain range that could have been plucked straight from a storybook stretches into the horizon. Contours in the snow, distant trees, flowing water, and a shimmering atmosphere paint the beautiful fantasy world that is Mt. Domna. Hues and shades of blue and white and green are vivid and striking. Shadows stretch from trees and rocks. I haven�t seen quite this combination of realism and cartoon in a game before, and it perfectly fit�s the game pacing and tone. The main character Nikolay looks good too, except for the fact that his shredded nose flops around in the breeze, as if he had just stuck his face into a food processor. 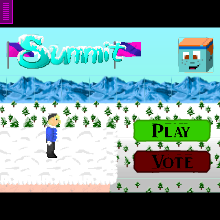 Summit is first and foremost a puzzle game. Throughout the levels you�re thrust into a multitude of different settings, each with their own scenario, and most of the challenges involve exploring the environment for keys or other objects that interact with each other. Somewhere in each level there is a phonebooth you can enter, in which a faceless entity speaks to you, offering hints about where to go or what to do. They help, make no mistake, but sometimes they�re just weird (�What�s a mouse�s favorite food? SNOW DRIFTS!�). After a while though, the phonebooths start to display static, which I guess is due to the bad reception this high in the mountains. Gustav should have thought about this in case he ever wanted to order a pizza or something like that. The actual puzzles themselves, however, are another story. I already mentioned the exploration-based challenges, but some portions of the level require you to apply your kindergarten math skills to pass through a certain section (I should mention that this level is broken in that you can pass through the door without attaining the key). Another level requires you press colored buttons in a certain order, despite the fact that the correct order is displayed right there in front of your face just to the side of the buttons. The disarming ease of puzzles like these threw me for a loop as I was playing. Not only were they simplistic, but they just seemed incredibly out of place. Why couldn�t the entire game be exploration-based? One level even has an RPG twist where you perform different tasks for the villagers in order to find the next key and move onwards. That was pretty cool; not only was it different but it was also refreshing engaging. The math and color puzzles just seemed like a cheap cop-out, something stupid simple in a blustering attempt to be different. The lag was also sometimes an issue. You felt so slow and dumb wandering through the levels, only to realize you were supposed to go back in some other direction and grab something, so it was another glacial journey back to one side of the screen to acquire a key or ax or whatever just so you could bring it back and splode with a tree or something like that. This made the game feel stretched and forceful, which I know isn�t the fault or intention of the creator, but that doesn�t change the fact that it still made it feel stretched and forceful. One level really got my goat. The challenge in that one involves three of those puzzle grids � you know, those 3x3 tiles that you slide around in order to form a picture � that you must solve in order to pass, or else risk dying. Never in my life have I ever felt more stupid playing a game. Despite these puzzles being only 2x3 it still took me the better part of a half hour to slide the tiles around and form poorly rendered pictures of fruit. The apple took me about thirty seconds, the watermelon five minutes, the banana�twenty-five. And it didn�t help that the tiles would sometimes bump into each other and float about in their paths, forcing me to perform some frantic dragging and rearranging just so I could get my mental bearings back on track. Annoying. Oh yeah, the floating problem�they all float down here. And what that means is that objects would float around freely based on the momentum you provide when you drag them, and on rare occasion they�d zoom out of frame and exit the playing field, forcing me to restart the level. This only happened about twice, but it�s that sort of aggravation that CAN be blamed on the creator. Stuff like that really takes the player out of the game and is the source of undue frustration. Speaking of glitches, I ended up giving up and quitting the game on Level 8 because the game spazzed out and Nikolay kept skyrocketing upwards, unable to move anywhere else around the playing field. I�m sure I didn�t miss much though. So here, like M I N D, we have another beautiful and visually pleasing puzzle game that unfortunately suffers from the same problem that plagues a majority of Sploder games in my opinion. Whenever I finish a game, I ask myself: �If you stripped the game of its graphics and visual appeal, would it still be enjoyable on experience alone?� Sadly, I can say with certainty for Summit that the graphics do not make up for the gameplay. They�re beautiful, don�t get me wrong, and the artist(s) should be proud of themselves for coming up with an art design that�s not only glamorous but also unique. It�s just a simple fact that I found the gameplay underwhelming and borderline irritating. From the inconsistent puzzles to the lag to the obvious oversights in design, Summit can only be described as a prettily-decorated cake that is also, unfortunately, full of empty calories and bleepe to toothaches. Maybe some traps or some enemies or more interactive, action-oriented mechanics would have helped in making this game more memorable and enjoyable. There are great and fun ideas here, and there�s potential, and I believe based on this game, autumnwinter can truly create something incendiary and truly enjoyable. But as an experience, I just wasn�t buying it.